A century and a half before Richard Riordan was lording over one of the largest and most influential cities on the planet, a dashing, polite yet politically savvy Newhall man was mayor of Los Angeles. 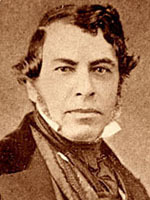 Ignacio del Valle was part owner of the 50,000-acre Rancho San Francisco, which comprised most of the modern boundaries of the Santa Clarita Valley. He was also a state legislator and major player in Southern California politics. "No One Murdered in Los Angeles Yesterday." 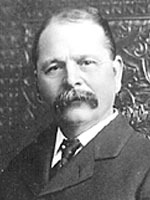 As mayor of Los Angeles, Del Valle felt the need to clean up the streets, and to that end he formed the California Rangers, led by the on-again, off-again resident of the SCV, Major Horace Bell. When you need a job well done, you send for a man from Newhall. Bell picked three captains to lead his posse and two of them were the feared Newhallians, Cyrus Lyon and W.W. Jenkins. Cyrus, a native of Maine, had built quite a reputation as a pistol fighter. Later, the county of Los Angeles would name one of the SCV's major thoroughfares, Lyons Avenue, after Cyrus and his twin brother Sanford. As for Jenkins, he was a colorful soul who looked like Gabby Hayes but was one of the most dangerous men in all of Alta California. Later, Jenkins would be one of the major participants in the great 40-year-long Castaic Range War in which between 22 and 27 men would be killed. Jenkins also would set himself up as an erstwhile Judge Roy Bean, acting as lawman, judge, jury and executioner in the famed Section 23 War that even Teddy Roosevelt could not stop. Anyway. Bell, Lyon, Jenkins and a man named Bill Reader would send the crime rate plummeting in Los Angeles simply by shooting, bludgeoning, lynching, beating up or running out of town anyone they found suspicious. Crime virtually disappeared, and these stone-age versions of the Los Angeles County Sheriff's Department basically worked themselves out of a job within two years. Newhall officially became a town in 1876, and two years later we got our first official Los Angeles County Sheriff's deputy — one John Howe. With more saloons than schools and churches combined, the SCV was a rough-and-tumble Wild West community in the late 19th century. Interestingly, Howe's most memorable act as lawman here was not any gunfight with bad guys or rounding up rustlers. It was staring down a lynch mob of church-goers. A long-forgotten parish of revivalists had hired out the newly built Newhall Elementary School (when it was on 9th and Chestnut) for their Sunday services. A few blocks away, at the Derrick Saloon, two drunken combatants had initiated what would be an epic barroom brawl, starting in the pub and working its way outdoors to the front of the little two-story schoolhouse. One of the men ended the fisticuffs portion of the episode by picking up a good-sized chunk of lumber and beating his foe unconscious. The pastor and his flock rushed the injured man inside, where he died on a wooden table. Invoking the Old Testament, the pastor ordered his parishioners to grab the surviving fighter and cart him about a half-mile away to the Placerita Creek Bridge. Back then, the bridge was rather sizable and there was a drop of about 15 feet to the creek below. Just as the congregation was to lynch the man, Howe came riding up to the rescue, threatening to shoot any of the religiously righteous should they push the benoosed man over the side of the bridge. A Los Angeles judge would later rule a bit kinder on the killer, sentencing him to two years in jail. Reportedly, the man lived a decent life after that experience. We don't know if John Howe was against jails. But he didn't have one. Evildoers in early Newhall were simply chained to the large oak tree that used to sit in front of the Hardison and Stewart warehouse, facing Railroad Avenue today. There, in rain, rare snow or bristling heat, the perps waited for the sheriff's wagon to cart them off to Los Angeles to serve their time. There were reports that, for some of the more heinous offenders, a bouncy wagon ride to downtown wasn't really necessary. Some were executed via a hangman's noose from that oak and, according to historian Jerry Reynolds, locals would make it a social occasion, bringing blankets and box lunches to watch. And while we're talking oak trees, much earlier, in 1849, we had a vigilance committee. Their first recorded act of primitive justice occurred that year when they caught up with a gang of bandits who had been terrorizing the area. They tried them on the spot, in the hills above, ironically, today's Ed Davis-Towsley Canyon State Park. There, the seven bad men were hanged simultaneously from the seven branches of a great oak. As these stories go, the gang of seven had a treasure of stolen gold bullion that has yet to be found. It was a perfect headquarters for the town sheriff. He was privy to all the town gossip and could eavesdrop on planned shenanigans. Leighton employed two sisters at his tavern, Flora and Dora Lake. The girls married well, one hitching up to the justice of the peace and the other wedding Alex Mentry, the local oil magnate. Anywho. Los Angeles County steps in near the turn of the century to announce they will build a jail in downtown Newhall. Now picture the Santa Clarita Valley around the turn of the century. The Census put 442 people proper on the valley floor, so we're talking lots and lots and lots and lots of open space. Where does the county want to construct that first jailhouse? Right smack next door to the town's first citizen, John Gifford and his wife, Sarah. Gifford was livid and, understandably, didn't want the hoosegow with all its inhabitants' swearing and drunken protestations at all hours of the night being so close to his family. Gifford buys some land across town — across the street where the American Legion Hall sits on Spruce. He even goes so far as to draw up plans for the edifice. The 12-by-20 log cabin, with open-air rebar windows, less labor, had a materials cost of a staggering $68. With a few improvements, the estimate was upped to $236.25. That plan was drawn up in 1888 and criminals were inhabiting it later that year. The jail did just fine until 1906. Officers Ed Pardee and McCoy Pyle were the county lawmen in Newhall then. In January of that year, an inmate had face and arms dangling out the window of his cell and asked a passer-by for a cigarette. He was obliged. Maybe the convict couldn't be blamed. After all. This was before there were safety films about the dangers of smoking in bed. But on that cold January evening, the incarceratee's cigarette caught his bunk on fire and the entire jail soon followed. Just a month later, a modern state-of-the-art adobe jail was built. With the county involved and inflation, the going price for building a simple jail had now escalated to $2,237. A little sheriff's-Martha Stewart trivia: The jail sat five inmates somewhat comfortably. But all was not ducky with that jail. It was made of adobe, and adobe can be a forgiving building material. After being harassed by the unforgiving temperature differences of the Santa Clarita, the adobe became rather porous. For mirth and to pass the time, some inmates would simply moisten an index finger and start drilling their way out. Even the Los Angeles Times made fun of us, scribbling a 1922 front-page cartoon on the sad state of our jail, with hobos sticking their heads and shoulders out the roofs and sides of the building. By the way. You can still visit this original Newhall Jail. It's in the same exact spot, except today, it's called the Antique Flower Garden, at the corner of Spruce and 11th. The cells and bars are still up, and, they have some pretty nice flowers. ©2000 JOHN BOSTON & SCV HISTORICAL SOCIETY | RIGHTS RESERVED.